Run by the Yowah Community, the Yowah Opal Festival Designer Jewellery Competition was commenced in 1997 to begin to promote Yowah Opal. Opal the Queen of gems, is Australia's National Gemstone and Yowah is known for its beautiful and unique opal nuts - ironstone concretions which hold opal deposits in their centres. Its popularity and value has spread world wide. Like all opal, no two pieces are identical. 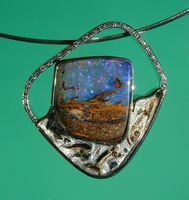 Pipe, crystal, Opalised wood and boulder opal can also be found.